Finland: Reinforcements are hindered south of Leningrad by Axis rail breaks. The 10th Mech wheels south and cadres another Finish Division but at the cost of cadreing a 7-4-8 Armoured division in the Exchange. 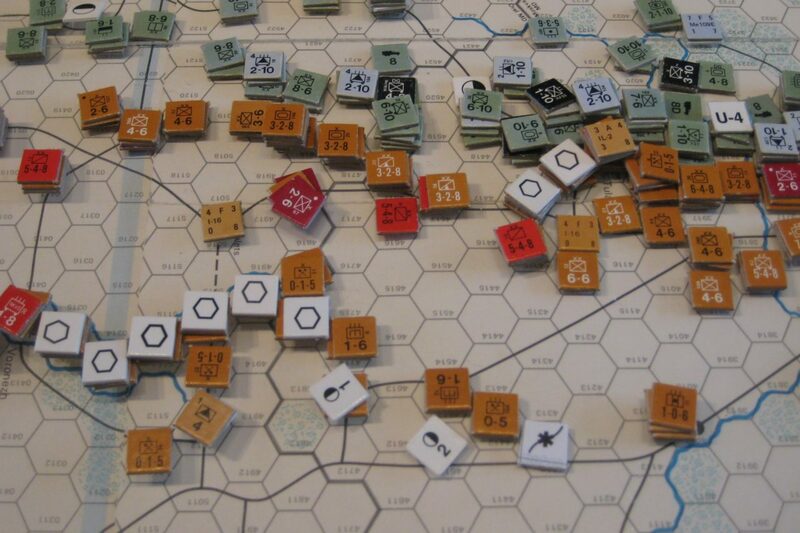 Leningrad Front; Trying to pressure the German line south of the city a scratch attack fails against a German infantry division in an unlucky 4:1 NE result. Close to Kalinin reinforcements try to bolster the defence but are not strong enough to counter attack the German line. Moscow Front: Winterized troops are exchanged by regulars in the front line to assemble a counter attack force. A single attack is lunched against SS Viking succeeding is reducing this and an accompanying Mot divn to cadres but at the cost of two winterised divisions falling in the exchange. Fearful that they can do no more than watch as city hexes fall the Capital and Factory are prepped for departure. Voronezh Front: All quiet as the rear defence line continues to be strengthened and spare troops move forward to attack positions. Kharkov front: is redesigned Rostov Front following the fall of the city but all is inactive. Crimea; Troops fall back to Sevastopol for a last stand.